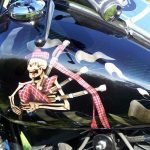 One of the sharpest paint jobs ever put on a motorcycle belongs to a bike called “Hell’s Piper”. With a base color of Black Watch plaid and black candy, it is one of the most amazing paint jobs I have ever seen. Shawn Palek did an incredible job on it and the technique he used to accomplish it was featured in the Iowa motorcycle magazine “Throttler” in 2009. Hell’s Piper is the first ever “Fatboy Low” and no other artist could have made it look so good. Thank you Shawn.